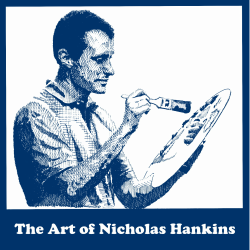 Nicholas "Nic" Hankins has always had an affinity for details and the ability to capture his unique vision of our everyday world on canvas. Nic has enjoyed a life-long passion for art, inspired by the talents of his Father, Jerry, and encouraged by both his parents since the "crayon days". Certain that art would forever be an important part of his life, Nic began his pursuit of a career in the visual arts field during high school; a path that would lead him to a B.F.A. in Studio Art from the University of Tennessee, Knoxville in 2005. As an instructor, Nic has enjoyed teaching many enthusiastic students in his native East Tennessee, across the country and around the world; sharing the excitement and gratification of creating with others as far away as Taiwan. Nic has participated in several solo and group exhibitions of his work. Though he does not actively pursue gallery representation, his work may be seen periodically in local shows and festivals. If you would like more information about purchasing original pieces from the artist, please make inquiries through the contact page of this website or visit the gallery page to view a limited selection of available works. If you are interested in hosting a painting workshop with Nic at your studio, community/conference center or church, please contact us for more information! "Have brush, will travel!"